PAPERBACK. 1789540801 Brand New ,Original Book , Direct from Source , Express 5-8 Business days worldwide Delivery. . New. 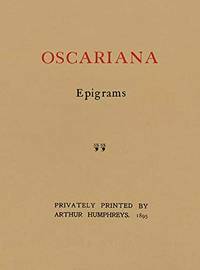 Oscar Wilde - Oscariana - Paperback. Book. BRAND NEW.